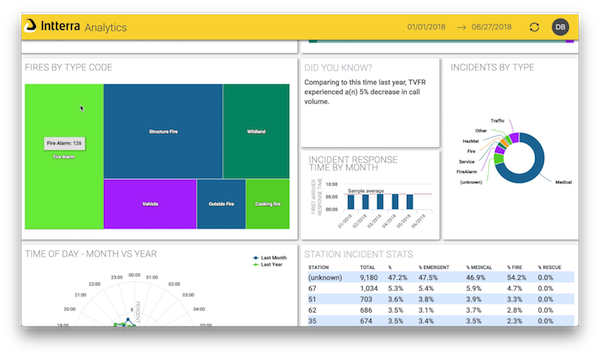 The Fire Data Lab isdedicated to accelerating the use of data-driven decision making in the fire service throughout the United States. Created as a partnership between the Western Fire Chiefs Association (WFCA), multiple Public Safety Organizations (PSOs), and Intterra, the Fire Data Lab (FDL) facilitates the sharing of data among participating agencies. The goal is to improve fire service outcomes by revealing opportunities to do things like shorten call response times, or better allocate resources. Using science and data for better planning and decision making means fire agency leadership has a better foundation to build toward better results. Read on for more detail about how you can bring data science into your operation. Why a Webinar Series? And why focus on Education? We are a software company. We may be from the fire community with lots of operational experience - but we are a software company. 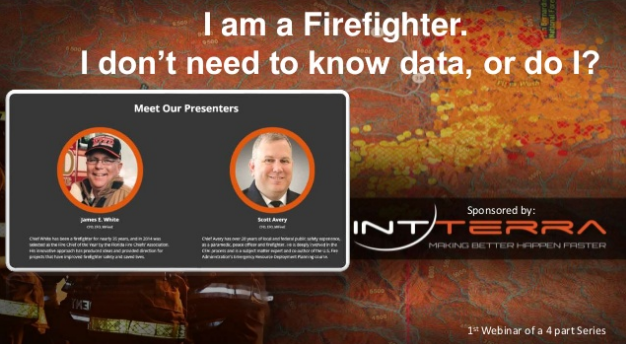 And as we have worked across the country for the past 6 years, we know that fire departments are in all different places and all kinds of hot-messes when it comes to data. We see something you don't everyday - that you are all wrestling with the same problems, and solving them independently takes more energy, money and time than it should. We don't all have to create tactics to deal with IT issues any more than you would create all your own fire ground tactics. You collaborate, you go to class, you train and drill on the best ideas, and you work together. The best tools you have are the ones you use everyday. This is true both with equipment on the engine and tools you use for technology - specifically how you choose to integrate the data you already have - and make it useful to Operations, and every other part of your agency. Everyone wants to do the right thing with, they just don't all know how. It's not really fair, you signed up to fight fire, but you often fight more with spreadsheets. We think that providing top speakers and free webinars will relieve you a little bit. We will show you how to use what you've got. And how to make it easier - and how to make it mean something for outcomes. Mastering the use of information and data makes the biggest difference you can make for your mission these days. You have good training, good tactics, good apparatus. But are you applying them to the right things, at the right times, with the right people the right way? Good analysis will tell you that, and good tactical tools will help you do that. So there it is - we are creating a similar environment for learning about technology as you would look for to learn about interior firefighting or the newest EMS procedures. But isn't the fox in the hen house? Obvious question here: Should a tech company be bringing an educational series to the fire service? Absolutely. We're not ashamed of knowing a ton about tech, and sharing what we know. Also, you know the Fire Service is small - and if we were using the webinars to just sell our software, or if we were doing bad business with Fire Departments around the U.S., you would know it and pass it on. The fact is that we are proud to be in the the Fire Service, and we are really proud of our product. And we know that because we do a good job, bring value, make you successful - that the people that will tell you about our software are your buddies from other departments. Or call around, you'll find out about us. So - That frees up a little bit of our time to give back, to educate, to introduce you to each other, and to move the Fire Service with it's patchwork of technology solutions forward. Technology should be easier. There is a road map. And Fire Departments need to find ways for everyone in the organization to benefit from it everyday.